Camping takes you on exciting adventures into the natural world. You'll learn to explore and live with others in the out-of-doors. You'll learn to be a good citizen of the outdoors. This historic camp is located along the beautiful St. Croix in Wisconsin. Hiking destinations include "Friendship Rock", this unique stone amphitheater. 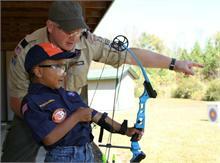 Enjoy a weekend or a day of fun-filled activities like archery, games, adventure, outdoor skill-building and exploration. Camping provides unique opportunities for advancement and earning belt loops. Create tasty camp meals, enjoy campfires and roast marshmallows with friends and family. Camping fees, permits, programs and most of your food are included. Scout Accounts are available for this camp. Camperships are available (see section below). For each person in your family wishing to attend, each of the following forms must be turned in. Use the links below to download and print the necessary forms. A completed, two page Camping Participant Waiver for each participant. We have some Annual BSA Health & Medical Records, health insurance ID photocopies, and Camping Participant Waivers on file for some adults and scouts who participated in other camps this year. Please ask the Outings Chair if any of your already completed forms are on file. To ensure that our volunteers can properly plan for the many people who will attend; your payments, Family Camp Registration Formand other required forms must be received by the Outings Chair no later than Saturday, April 27. Registrations received after the April 27 Pack Deadline will be wait-listed with no guarantee of enrollment. Read Pack 151's Outings Policy for more info. If you choose a Weekend Overnighter Option: In accordance with the Boy Scouts of Americia's requirements the Pack must follow the BSA's Guide to Safe Scouting, privacy and sleeping arrangementStandards and Youth Protection policies. Male and female adults require separate sleeping facilities. Married couples may share the same quarters. Male and female youth participants must not share the same sleeping facility. Tents: Married couples are allowed to sleep together with their children in a tent they bring to camp. No youth is allowed in the tent of an adult other than his/her parent or guardian. Group cabins: Separate male & female group cabins are a good option for campers who prefer not to sleep in tents and those who aren't allowed by BSA rules to sleep in a tent together. These will be the "Peterson 1 & 2" cabins. Everyone pitches in, but we need extra help. Family Camp is a hands-on experience for all participants. Helping cook meals and keeping the campsite clean is a responsibility for all. In addition, we need extra volunteers, preferably with some experience to plan meals, coordinate gear, plan and help with age-appropriate activities, etc. You'll have plenty of help. Can we count on you? Contact the Outings Chair for a list of volunteer opportunities. The Pack will bring along camping equipment, but we'll also rely on everyone to supplement our gear. More information will be provided in the weeks ahead. Please refer to Pack 151's Outings Policy for more info. Please give me an envelope containing all your Registration Requirements at an upcoming Pack Meeting or a Tiger Den Meeting. You can also drop it off anytime in a small plastic "Cub Scouts Drop Box" on my front porch. Just make sure I receive it by April 27. Please email me if you have any Family Camp questions, or if you can offer us a little extra help.